The Cold War we are familiar with ended with the collapse of the Soviet Union. In his new book “The Plot to Scapegoat Russia,” lawyer and human rights activist Dan Kovalik writes about a new Cold War against Russia – and about the peace that never came. He discusses the role of the Democratic Party and the CIA, but his book centers on exploring the cause of why hostilities are back. The real motivations of revived confrontation are hardly the stuff of day-to-day news, and so the author relies upon the historical record for discovering the origins of a new Cold War. Along the way he explains why the old Cold War was waged. He regards the commonly – accepted explanation as a pretext: “the Cold War, at least from the vantage point of the US, had little to do with fighting ‘Communism,’ and more to do with making the world safe for corporate plunder.”Implicitly this proposition serves to account for other U. S. wars and interventions. Without elaborating, Kovalik casts the CIA as the lead plotter in these intrusions. It has the right skills, he suggests, because it is “a nefarious, criminal organization which often misleads the Ameri­can public and government into wars and misadventures,” In his own book, “The Devil’s Chessboard,” David Talbottraced the Cold War machinations of former CIA head Allen Dulles’ and thus was well qualified to provide an introduction for the present volume. These two themes – the real reason for why the United States fights wars and the CIA’s role in such wars – set the tone for the history Kovalik recounts in his highly recommended book. Readers hungry to know about the “plot” advertised in the book’s title will need patience. At the point Kovalik is discussing the current U. S. – Russia confrontation, he has already conducted a tour over time and across the world that surveyed U. S. interventions and foreign meddling. Having identified patterns of U. S. aggression, he presents a scenario that clarifies U. S. motivations for abusing Russia. This book offers materialso encompassing as to belie its small size. Kovalik’s writing is clear, evocative, and readable. Along the way, he recalls those causes and the outrage that fired up activists who were his contemporaries. That’s a side benefit. In college Kovalik learned about CIA machinations in Central America. Revelations from former agents Philip Agee, Ray McGovern, and John Stockman astonished him. His first trip to Nicaragua exposed him to a harvest of killings and terror. He learned first-hand about the role of Contra paramilitaries, recruited and paid for by the CIA. At one point he was comforting a father burying his son, killed by the Contras, along with 50,000 other Nicaraguans. The author recalls the four churchwomen and six Jesuit priests murdered by U. S. – trained soldiers in El Salvador, U. S. support for soldiers and paramilitaries who killed and displaced populations in Colombia, and the CIA’s Operation Condor by which South American client states murderedpolitical enemies. He recounts U. S – instigated coups in Iran, 1953; Guatemala, 1954; and Chile, 1973. Along the way he mentions U.S. war in Vietnam, occupation and war in Korea, nuclear bombs dropped on Japan, nuclear testing and dying in the Marshall Islands, and the CIA’srecruitment of the anti-Soviet Mujahideen in Afghan­istan. This was the justification: keeping “the world safe from the threat of Soviet totalitarianism.” Then the Soviet Union was no more and the search was on for a new pretext. Having turned to “humanitarian intervention,” the Clinton administration soon was assisting the Paul Kagame regime in Rwanda and other African nations as they assaulted the Democratic Republic of the Congo. “US mining interests” were satisfied, Kovalik says, but “nearly six million people” people died. Clinton’s government intervened in Haiti and participated in the destruction of Yugoslavia, Europe’s last socialist state.Supposed humanitarian motivations were behind the United States role in delivering Libya into chaos. For the author, U. S. pretensions and brutality stand in contrast to the relatively benign nature of Russian misdeeds. Thus terror was exported to Afghanistan, Iraq, Somalia, and Yemen, where Saudi Arabia acted as a U. S. proxy. The list includes the 2009 military coup in Honduras facilitated by Secretary of State Hillary Clinton. Having surveyed decades worth of U.S. interventions abroad, military and otherwise, Kovalik turns to Russia. In the early 1990s that fledgling capitalist state was in crisis, he reports. Life expectancy had plummeted, the poverty rate was 75 percent, and investments in the economy were down 80 percent. National pride was in the cellar, the more so after the United States backed away from Secretary of State Baker’s 1991 promise that NATO would never move east, after the United States attacked Russia’s ally Serbia, and after the United States attacked Iraq in 2003 and Libya in 2011 without consulting Russia. He argues that the Obama administration, particularly Secretary of State Hillary Clinton, was obsessed with Russia and that Democrats currently are fueling hostilities, backed by a compliant media. He discusses WikiLeaks revelations about the Democratic Party and hacking attributed to the Russians. He also suggests, without offering specifics, that the CIA is involved. Kovalik doesn’t comment on possible interaction between Trump campaign personnel and Russian officials. But prior to his discussion of confrontation with Russia, Kovalik had devoted considerable attention to why and how the United States harasses other countries. The reader, therefore, already knows never to expect U.S. imperialism to give Russia a break and knows why that is so. W. T. Whitney Jr. is a former pediatrician that now lives in Maine, USA. He usually writes articles on Latin America and casually on health care. An in-depth look at the decades-long effort to escalate hostilities with Russia and what it portends for the future. Since 1945, the US has justified numerous wars, interventions, and military build-ups based on the pretext of the Russian Red Menace, even after the Soviet Union collapsed at the end of 1991 and Russia stopped being Red. In fact, the two biggest post-war American conflicts, the Korean and Vietnam wars, were not, as has been frequently claimed, about stopping Soviet aggression or even influence, but about maintaining old colonial relationships. Similarly, many lesser interventions and conflicts, such as those in Latin America, were also based upon an alleged Soviet threat, which was greatly overblown or nonexistent. And now the specter of a Russian Menace has been raised again in the wake of Donald Trump’s election. 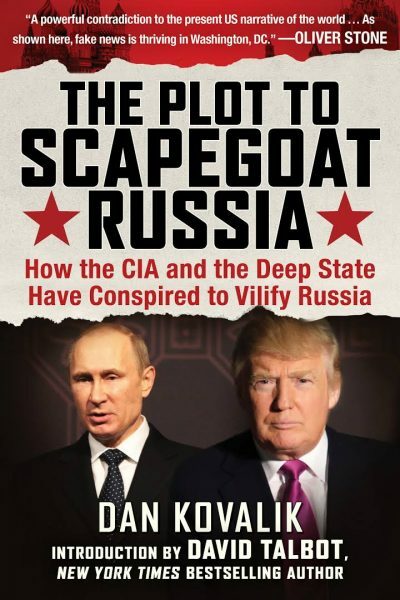 The Plot to Scapegoat Russia examines the recent proliferation of stories, usually sourced from American state actors, blaming and manipulating the threat of Russia, and the long history of which this episode is but the latest chapter. It will show readers two key things: (1) the ways in which the United States has needlessly provoked Russia, especially after the collapse of the USSR, thereby squandering hopes for peace and cooperation; and (2) how Americans have lost out from this missed opportunity, and from decades of conflicts based upon false premises. These revelations, amongst other, make The Plot to Scapegoat Russia one of the timeliest reads of 2017.